Over one million people took to the streets on Saturday to demonstrate against Brazilian far-right presidential candidate Jair Bolsonaro. The #EleNão (“Not Him”) campaign staged protests in more than 260 cities across Brazil, Brasil de Fato estimated based on information provided by the organizers. New demonstrations are planned to take place on Oct. 6, the day before the first round of the elections. The protests last Saturday were organized by hundreds of people’s rural and urban movements and saw a massive turnout in major capital cities in Brazil. The women also released a manifesto to explain why they are mobilizing. The #EleNão campaign gained momentum after opinion polls showed the far-right candidate in the lead in the election race. Women all over Brazil started to mobilize on social media against fascism and the hate speech encouraged by Bolsonaro. As protests intensified, the controversial candidate also saw his unpopularity grow. The latest Datafolha poll, released on Friday, Oct. 28, showed 46 percent of responders would not vote for Bolsonaro under any circumstances. The banners, posters, and signs seen in the hundreds of demonstrations expressed people’s rejection of the “coiso” (“the thing”), as the Social Liberal Party (PSL) candidate was dubbed. But they also expressed positive demands, advocating for public health and the fight against gender-based, racist, and LGBT-phobic violence, as well as labor rights. Alexania Rossato, a leader of the Movement of People Affected by Dams (MAB), took part in the protest in Rio de Janeiro, where 200,000 people demonstrated, according to the local organization. 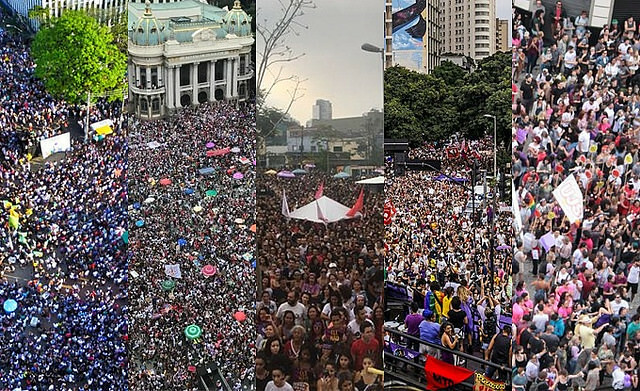 In São Paulo, the #EleNão demonstration gathered approximately 500,000 people. The protesters shouted “Not Him” and called for respect for women, black people, and LGBT people. Countless banners decried Bolsonaro’s neoliberal platform and the measures imposed by president Michel Temer, such as the Labor Reform and the Constitutional Amendment 95, an austerity package to freeze social spending for the next 20 years. The conservative measures proposed by the PSL candidate were also criticized as setbacks in Belo Horizonte, capital city of the state of Minas Gerais, which saw around 100,000 people gather to protest against Bolsonaro. In Recife, capital of Pernambuco, 250,000 people took to the streets. 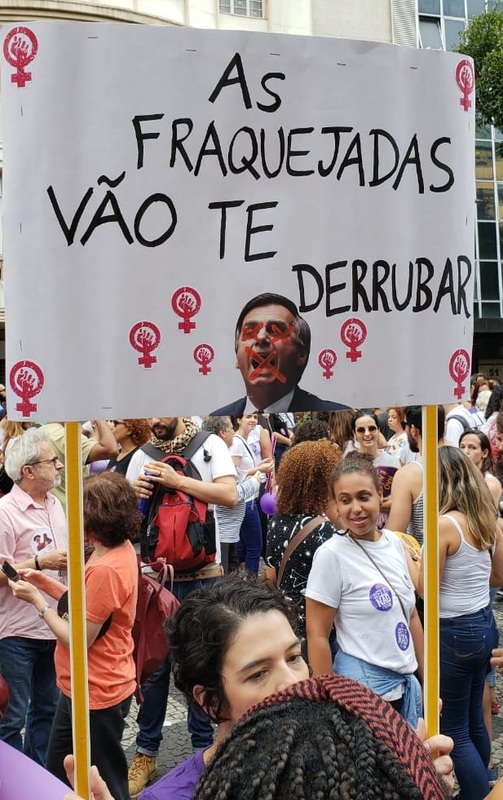 Elisa Maria, from the World March of Women, took part in the demonstration and said that, while Bolsonaro is a continuity of Temer, he also represents an aggressive defense of dictatorship. “We want an economy focused on the poor, not the rich,” she said. In Brasília, more than 30,000 gathered against Bolsonaro. The human rights activist and Rio de Janeiro councilwoman Marielle Franco, who was killed 6 months ago, was honored in several demonstrations all over Brazil. Bolsonaro was the only presidential candidate who did not made a statement about the crime at the time of her murder. Carla Ambrósio, from the Black Women Against Bolsonaro collective, said Franco represents the daily struggle and resistance of Brazilian women, especially black women and women from the outskirts. “As a councilwoman, she fought for the people on the outskirts, especially in the Maré [slum complex], to have decent housing, a decent living, and not only survive. When they killed Marielle, they thought they would silence us and bring us down. But the opposite happened, we became stronger,” she said. While Brazil is facing a serious political climate right now, the demonstrations were staged in a lighthearted mood. Protesters played in drum bands and huge concerts. In Salvador, Bahia, 50,000 people watched renowned singer Daniela Mercury as she performed. “We cannot accept someone who brings hate and violence to Brazil,” she said. 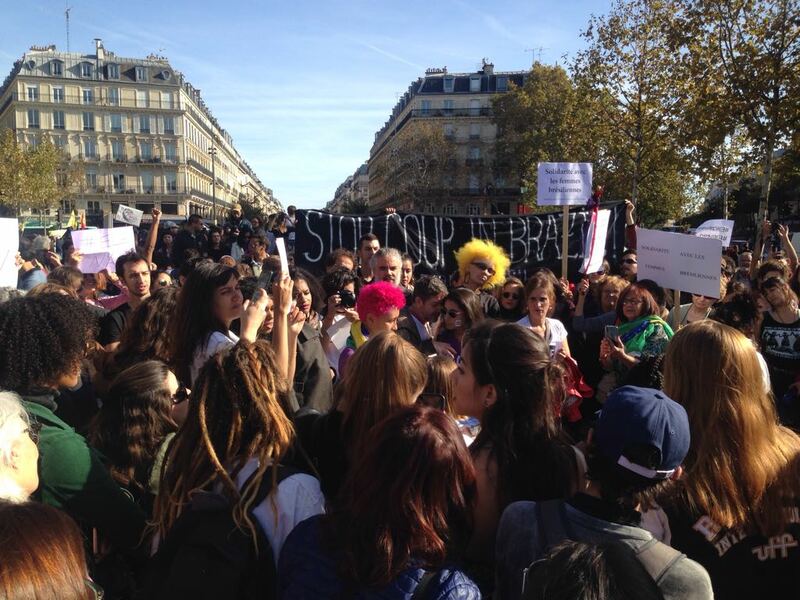 Dozens of #EleNão demonstrations were held in the Americas, Africa, Europe, and Oceania. In Europe protests were staged in Berlin, Germany; Amsterdam and The Hague, Netherlands; Dublin, Ireland; Malmö, Sweden; Milan, Italy; Paris and Lyon, France; Santiago de Compostela and Barcelona, Spain; Porto, Coimbra, and Lisbon, Portugal; Oslo, Norway; and Aarhus, Denmark. In the Americas, demonstrators gathered in Buenos Aires and Rosario, Argentina; Atlanta, Boston, and New York, USA; Quebec, Canada; and the Dominican Republic. In the African continent, people protested against Bolsonaro in Cape Town, South Africa, while in Oceania there were demonstrations in Melbourne and Sydney, Australia.